Pump manufacturer Kirloskar Brothers Limited (KBL) will co-sponsor the Puneri Paltan team, representing Pune, in the 5th season of the Pro Kabaddi League scheduled to be held from 28th July to 28th October 2017. The official announcement of the association was done by Mr. Anurag Vohra, India Business Head, at a ceremony recently held in Pune. On the occasion Mr. Vohra remarked “It’s truly a matter of pride and honour for an India-based company like KBL to be associated with a traditional Indian sport like Kabaddi as there is a natural commonality between the two. Kirloskar Pumps has been irrigating rural agriculture fields since 1926 and the origins of Kabaddi can also be traced back to the early 20th century rural India. Both embark a sense of “Make in India” feeling, and yes, both are representing Pune on the global stage.” He also pointed how the popularity of the Pro Kabaddi League is growing year on year with the franchise garnering the second highest viewership in the country after cricket. The Pro Kabaddi League is a franchise-based professional kabaddi league in India founded in 2014 and, this in its 5th year this season, will feature a total of 12 teams. 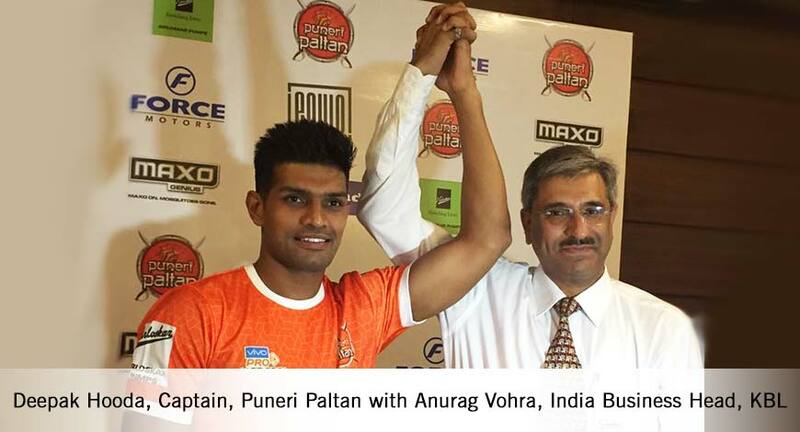 Meanwhile, the Puneri Paltan team is based in Pune Maharashtra, which held the second-runner up position in the last season. The team will be led by Deepak Niwas Hooda in season 5.